I've mentioned my volunteer grape tomato plant before, I know, I know, but here I go again. It's almost October and it's still going strong. What's a girl to do? I've already made a couple of batches of pasta sauce, a jar of tomato jam, not to mention the countless Caprese salads, but the little beauties keep piling up. So here's my next strategy: Garden Minestrone. The nights are getting cool, nothing like a bowl of hot soup to take the chill off. This came together very quickly due to the use of ready made vegetable stock and canned beans. However, I must say it tastes like you spent all day in the kitchen. There's something sweet about making a soup in early autumn and using garden fresh summer vegetables. You certainly can taste it in this broth. It's light and sweet, though not too delicate that it can't hold up to beans and pasta. You may notice the conspicuous lack of celery in this recipe. Let me explain- I've gotten out of the habit of buying celery unless it's organic. I do love celery in soups, but find I just don't go through it all before it goes limp. Bottom line, I hate to waste food. The veg stock I use has celery as one if the ingredients, so it's kind of in there anyway. In a large pot heat the oil and add the onions and carrots. Cook on medium for 5 to 10 minutes. Add garlic and oregano and cook for another 5 to 10. Meanwhile cook the tubettini according to the package directions (you're gonna want them al'dente) and rinse in cold water to stop the cooking, set aside. Add flour to the onions and carrots and stir to combine. Add 1 cup of veg stock, turn the heat to high and bring to a boil. Lower the heat and add the rest of the stock and 2 cups of water. Add beans, edamame and tomatoes. Cook for 20-30 minutes so everything comes together. Add the pasta and check the water, add more if necessary and heat till pasta is warmed through. Adjust the seasoning. Serve with basil leaves and grated Parmesan. Makes 6-8 servings. Can you feel it? That pleasant chill in the evening air? And do you know what today is? Bingo! The Autumnal Equinox. The sun crosses the celestial equator and day and night are almost the exact same length. (Not exactly due to the size of the sun and the time it takes to rise, blah, blah, look it up). So, kiss Summer goodbye and say hello to Fall. You can now commence celebrating by wearing sweaters, raking leaves, firing up the wood stove and eating oatmeal cookies. But not just any oatmeal cookies. Only the best are worthy of a celebration of this cosmic magnitude. I have just the ones for you- Glazed Oatmeal Raisin Spice (yes, with raisins). Equal parts sweet and spicy (did I mention the pepper), moist and chewy, healthy (cause of the oatmeal) and not so much (cause of the butter and sugar) but heck, it's a cookie so cut it some slack and Enjoy. These are the perfect foil for a cup of hot cider or a glass of cold milk. Go ahead and have a couple for breakfast (I won't tell anyone), and make sure you save a few for a midnight snack. About the raisins, if you don't like raisins put them in anyway. At least three people I know who say they don't like raisins ended up lovin these cookies, raisins and all! Preheat the oven to 350 degrees. Cream butter and add sugars and molasses. Beat to combine, scrapping down the sides of the bowl to make sure everything is mixed well. Add eggs and vanilla, mix well. Combine flour, spices, salt, baking soda and pepper and stir to combine; add to butter mixture and mix well. Add oats and plumped raisins. Make sure everything is mixed well but don't over mix. Scoop out cookies in rounded tablespoons on baking sheet, and bake for 10-15 minutes. Makes 36 cookies. Add milk to confectioner's sugar and mix until you have loose glaze. You may need to add more milk. You want a consistancy that's easy to spread but won't run right off your cookies. Spread on cooled cookies. Soba, or buckwheat, noodles are perfect for warm weather meals because they cook in 4 minutes and are so yummy eaten cold with some soy sauce and scallions. It isn't that much more work to make a meal out of it either. This dish was guided by a package of mixed mushrooms, a container of black sesame seeds, that vibrant ume vinegar and this lovely recipe. Also, I love eating with chopsticks. Heat veg oil in large skillet and saute onions, garlic and mushrooms over medium heat for 5 minuets. Blanche carrots and broccoli, add to skillet and remove from heat. Whisk together miso, soy sauce, ume vinegar and sesame oil and set aside. Cook noodles according to package instructions, drain and rinse. In a large bowl combine noodles and veg, toss with miso dressing and top with sesame seeds. Makes 4 healthy servings. We all need a treat at some point in the day. I'm I right or am I right? I don't think I could face the day without a piece of chocolate or a nibble of something sweet. And today I had a blond moment. No, not that kind. The kind with white chocolate and macadamia nuts. Yes, that kind. Sure I was off today but that doesn't mean I wasn't working. Do you feel me ladies, shopping, laundry, cleaning, de-fleaing?! (Hopefully not the last one for you, I wouldn't wish that on anyone. However we have 3 animals and it goes with the territory). The only thing that got me through was knowing I was going to make blond moment bars and eat several of them before my husband got home. It's a super easy recipe, you don't even need a mixer. The bars are sweet from the white chocolate and salty from the macadamia nuts and chewy from the addition of a little almond flour. I used a 9 by 9 inch pan and got 16 of them because they are on the rich side. Speaking of rich, if you don't want to spring for the macadamias than walnuts would be a good second choice although you will lose that salty note. Also I used a bar of Perugina white chocolate because I'm a bit of a snob when it comes right down to it but feel free to use chips or any chocolate of your choice. Preheat oven to 350 degrees and grease and flour a 9 inch square baking pan. Combine flour, almond flour, baking powder and salt; set aside. By hand or in a mixer, cream the soft butter, add sugar and mix well. Add egg and vanilla and beat to combine. Fold in flour mixture just until it's incorporated. Fold in chopped white chocolate. Transfer mixture to baking pan and level with a spatula. 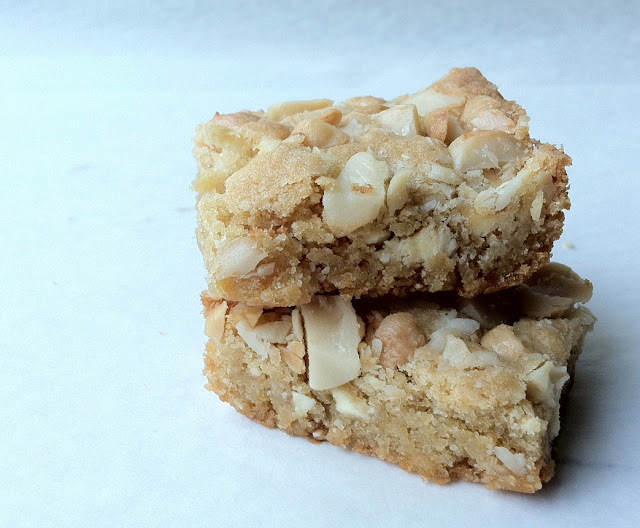 Evenly distribute chopped macadamia nuts on top and press slightly into batter. Bake for 25 to 30 minutes. Makes 16 bars. Cool before cutting or if you're like me just eat the first one hot. (Not responsible for you burning the roof of your mouth). I stopped by the Lansdowne Farmers Market on Saturday to get something, whatever looked good. In the back of my mind I wanted to make a pie, a peach pie. Just my luck the peaches were outrageously peachy. Huge, ripe, sweet- everything I was looking for. I grabbed a quart, that's how they are sold, and a free sample. That made 7 peaches, the perfect number for a pie. I do love making and eating pie. Just the word is comforting to me. Pie. Say it with me, pie. See don't you feel better already? And I find making pie to be comforting as well. Something about the dough and the anticipation. About the dough- there are as many recipes for pie dough are there are bakers making pie. Everyone has their own favorite and I'm sure it changes with the season, the temperature, the humidity and your mood. This recipe is made with whole wheat pastry flour, almond flour and butter; it was a dream to roll out and tender and flaky when baked. I blind baked the bottom crust and it held up to a very juicy pie without getting soggy. I skinned the peaches by the blanching method, you get a lot more peach this way than by just peeling them. If you're not familiar here're some good directions. This pie is really all about the peaches. It's not at all sweet (I was planning to have it a la mode anyway) and I went easy on the cornstarch so it was, as I mentioned, juicy. My mom was always making pies, apple and banana cream mostly. And, as you may know, she never threw anything away when it came to food, so she would make these little jam filled baker's treats with the pie dough scraps! Something to tied you over while the pie is baking and cooling. My interpretation below were filled with raspberry preserves and cinnamon sugar. I always use my hands, but feel free to do this in a food processor. Mix the flours and sugar together, cut in the butter until the mixture resembles a course meal. Add the water, just enough for the dough to form. Knead it lightly until smooth, wrap and chill for about an hour. Cut off 3/4 of the dough (chill remaining piece) and roll it on a floured surface about 1/4 of an inch thick and large enough to fit into your pie pan. Trim the edges if need be so you have a uniform 1/2 inch overhang. Roll the edge and crimp to secure. Chill for 1/2 hour. Prick the bottom with a fork to vent and blind bake in a 375 degree oven for 15-20 minutes or until lightly brown. You can use parchment paper and pie weights or beans although I found I didn't have to. It did puff up when baking but I just pricked it again as it came out of the oven and it went right down. Peel peaches and slice into 3/7 inch slices. Add sugar and cornstarch and gently toss to combine. Transfer peaches into pre-baked pie shell and place on a baking sheet. Roll out remaining dough large enough to cover the top of the peaches and the edge of the bottom shell. Brush the bottom edge with beaten egg and press the top crust into the edge along the crimps. Vent the pie top either by making a hole in the center (I used a decorating tip) or making 1 inch slits with a knife, or both. Brush remaining egg over top of pie and sprinkle with sugar. Bake at 375 degrees (preheated) for 35 minutes or until the crust is golden brown and the juices are bubbling. If the crust is getting too brown cover pie with a piece of tin foil. Cool completely before enjoying with French vanilla ice cream. Makes 8 mouth watering servings. There are some things that make my sister Bonnie say "there must be a god." Like those days when the garden is so beautiful, when the lotus blooms and goldfinches are at the feeder. Or you see a spider web as big as you or those clouds that look like Titian painted them. You know, when things are truly awesome. Not our-team-just-won-the finals awesome, but really, truly awesome. For me it's those volunteer tomatoes by the pond. I just shake my head every time I see them, and then again when I eat the fruit. Sure, maybe a bird pooped out a seed or maybe it was something undigested in the compost. Or maybe it was like that episode of Futurama where Bender meets that, for lack of a better term, "collection of galaxies" who tells him If you do things right they won't know you've done anything at all. Well, whatever, all I know is these tomatoes taste freaking awesome! A solid juicy fruit, the perfect amount of acidity, a delicate skin... all they need is a little salt, and maybe not even. But of course I couldn't resist dressin them up with basil and mozz for one more Caprese. Do you really need a recipe: cheese, basil, olive oil, salt, pepper, sunshine, rain and a volunteer tomato. Yea, there must be a god. I won't say I've had my fill of summer berry pies and tarts, never, ever. But I got the itch to bake something nutty. Enter the Alice B. Toklas tart. I haven't made this tart in years, it's long over due for a baking. As with so many recipes I've came to love and make repeatedly, I was introduced to this by my good friend Vince. He has a way of finding really lovely, simple things that were under every one's (except maybe Alice Waters) radar. If I remember correctly we baked this commercially for a time when we were both head bakers at a certain downtown Philly restaurant. We used a recipe adapted from Waters found in "The Pleasures of Cooking", a Cuisinart publication if I'm not mistaken, (and further adapted below). Unfortunately it had to compete with some over the top sugary delights like carrot cake with caramel pecan filling and chocolate killer cake. "A Tender Tart", as Alice B. called it in her cookbook, was far to subtle to stand up to the likes of these. It's a very simple, rustic, not too sweet, hazelnut tart with the most perfect buttery crust. Just right for a rainy, early September day with a hot cup of strong coffee and a book of poetry. For the dough, combine flour and sugar, and by hand or in a food processor, cut the butter in until the mixture resembles a course meal. Add vanilla and ice water and mix until a dough forms, do not over mix. Flatten, wrap and chill dough for about an hour. On a floured board (I used AP flour for rolling) roll out 2/3 of the dough to a 10 inch circle, reserve and chill the rest for the top. Transfer into an 8 inch tart pan, fitting any excess into the sides of the pan. Dock with a fork and chill for one hour. Preheat oven to 375 degrees, bake for 15-20 minutes or until golden brown. For the filling, grind hazelnuts to a course meal. Combine with eggs, sugar and lemon zest. Pour into baked tart shell. Roll out remaining dough and lay it gently over the filling pressing to seal the edges. Make 5 or 6 slits in the top to vent. Combine egg yolk and milk and brush on top of tart, sprinkle with 2 or 3 teaspoons of sugar. Lower oven to 350 degrees and bake for 25-30 minutes or until tart is golden brown and filling is set. Cool for 30 minutes before serving. Yields 8 perfect slices. Someday I want to share my mother's spaghetti sauce recipe with you. It is a doozy. You need at least a day to make it, but it is seriously worth it. You can taste countless generations of Italian cooks in every rich, mellow, meat infused mouth full. There's just one problem; I can share this recipe with you and give you a list of ingredients and some directions but I guarantee you it won't turn out like mom's. You see, primary to the success of this recipe is something that's not on the recipe card. It's something that's not even around anymore. And that was my mother's intention to make the best sauce of anyone, anywhere at anytime. Every Sunday when my mother made this sauce it was an exercise in perfection for her. And this personal alchemy was all in the little details. For instance, the addition of the water she used to keep her hands from sticking when making meat balls. She didn't like throwing things out, even this water. Her thought was that the water had a lot of flavor in it so why not! That's not really something you can quantify in a simple recipe. So, in the mean time, let me share a super quick and delicious pasta sauce (less arcane but equally as appetizing) made from fresh grape tomatoes. Have I told you about the volunteer tomato plants that are hanging around the pond this year? One is a grape tomato variety that has literally thrown itself across the pond and is spreading out in all directions yielding plump little gems. The other is an heirloom of some kind, and I just picked this giant beauty (spoiler alert: Last Caprese Salad of the Season). Cook the tortellini according to the package directions. Heat oil in a heavy bottom medium sized pot. Add onions, garlic and oregano. Cook on medium for 5-8 minutes or until onions are beginning to get translucent. Add tomato halves and cook for another 5-8 minutes. Stir in tomato paste, water, salt and pepper and simmer another 10 minutes. Pour sauce over cooked and drain tortellini and serve with grated Parmesan cheese. Yields 3 to 4 servings.